Submitted photo Nurse Natalie Sherry and Dr. Linda Bailey share the T-shirts honoring the Stop the Bleed Campaign. XENIA & BEAVERCREEK — Nurses Natalie Sherry and Christi Clark are champions of Stop the Bleed – Save a Life Campaign at Greene Memorial Hospital and Soin Medical Center. Their goal is to promote the national campaign and educate the public on how they can help in the event of an emergency. They are able to expand the program thanks to a grant provided by the Greene Medical Foundation. According to the national campaign website www.bleedingcontrol.org, the campaign was started by the federal government since uncontrolled bleeding is the most common cause of preventable trauma death in the United States. Sherry and Christi are Trauma Program Managers at the Kettering Health Network hospitals and instructors for the cause. The campaign was motivated in 2012 as a result of a mass casualty tragedy. A law enforcement agency sought to improve survivability. They saw a need for bystanders to have the skills to stop bleeding, explained Sherry. The free of charge, hour-long training presentation requires no prior medical knowledge and is followed by hands-on skill stations. Participants learn how to apply direct pressure and how to use or create a tourniquet. Sherry and Dr. Linda Bailey have championed the program at Greene Memorial, while Cristi Clark has started the program at Soin Medical Center. The Greene Medical Foundation helped to fund supplies such as the bleeding control kits needed for the training. “They have helped us get this program going so we can give back to our community,” said Sherry. If you are interested in the training or in having participating medical professionals come train small groups, contact Natalie Sherry at 937-352-2000 or email Natalie.Sherry@ketteringhealth.org. 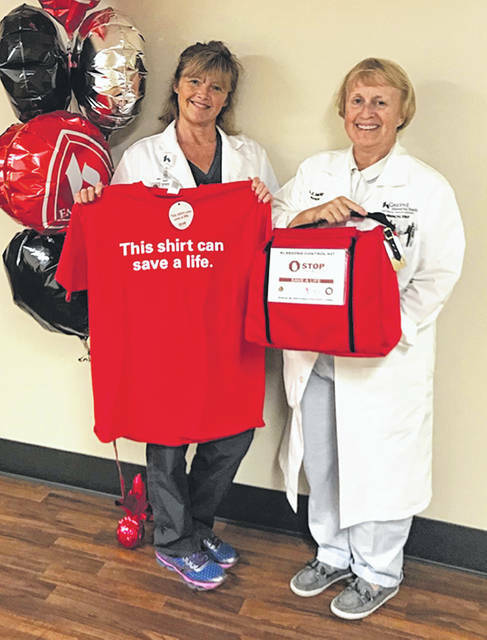 https://www.beavercreeknewscurrent.com/wp-content/uploads/sites/49/2018/07/web1_StopBleed.jpgSubmitted photo Nurse Natalie Sherry and Dr. Linda Bailey share the T-shirts honoring the Stop the Bleed Campaign.